A plant species long term survival depends on successful reproduction and an adequate diversity of genetics. Producing healthy offspring from a diverse gene pool is fundamental to a plants ability to be robust and healthy and to cope with change. The following two design principles are critical to ensuring a plants potential for health and long term resilience. A walk in the bush can teach us a lot about design if we know what to look for. For years when I first became involved with plant and animal surveys and other reserve maintenance like annual Boneseed pulls, activities that take you well off the beaten track into wilderness areas, I failed to notice that plants grow in groups. Now that I have had more experience, I tend to look for and see these groupings everywhere. Plant species grouping. These three words simply describe how plants of the same species nearly always grow together. This is because each plant species has a preferred home - a preferred soil, a preferred amount of light or shade, an adaption to dryness or wetness, an association with other plants (good neighbours), and even a preferred amount of seclusion and protection from the natural elements like strong winds. 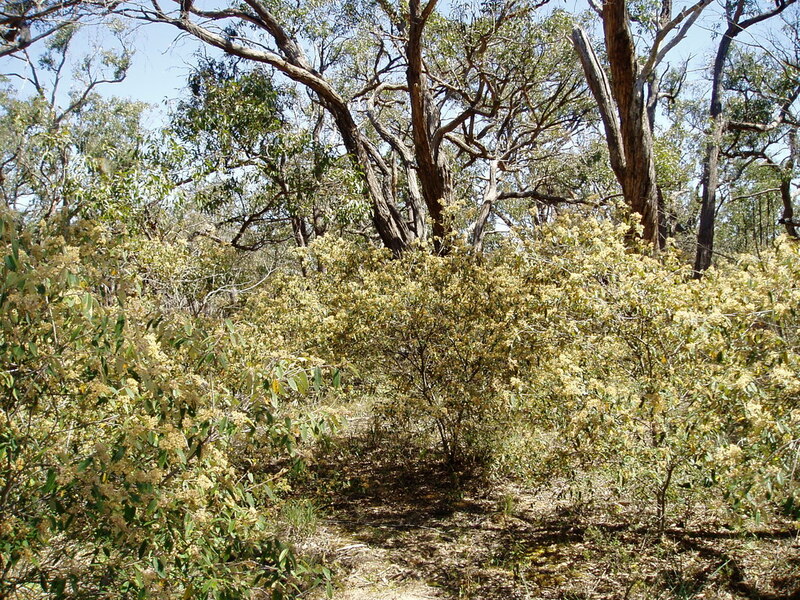 For example, canopy trees like Swamp Gum, Eucalyptus ovata; Narrow-leaf Peppermint Gum, E. radiata and Yellow Gum, E. leucoxylon all have preferred homes in the same woodland. A walk down hill from a ridge will likely start under the shade of Yellow Gums that thrive in dry exposed environments with shallow soils. When you reach the mid slope where it is moister and more protected, the Yellow Gums are likely to be replaced by Peppermint Gum and by the time you're crossing the damp gully at the bottom, Swamp Gum will be the dominant tall tree. 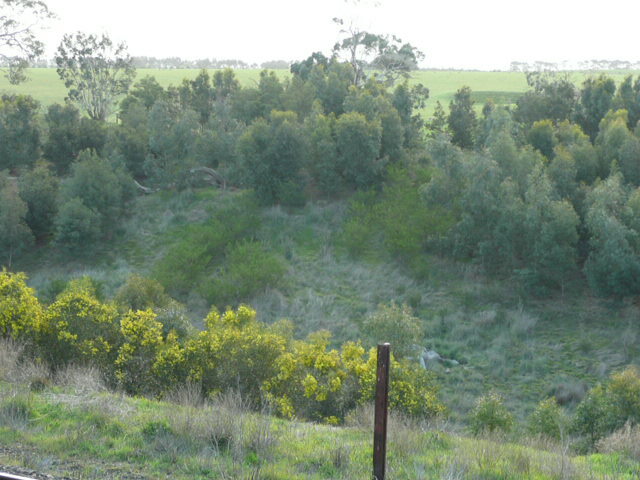 In this same woodland, the ridge will likely have a shrub layer of Saltbush, Rhagodia parabolica and Snowy Mintbush, Prostanthera nivea, and an understorey of Lightwood, Acacia implexa; Silver Banksia, Banksia marginata and Drooping Sheoak, Allocasuarina verticillata. All of these different species will be mostly growing in loose groups or clumps of the same species. For example the Mintbush would be grouped together providing a dense shrub layer under an understorey of groups of Silver Banksia and groups of Lightwood which intern would be growing under scattered Manna Gum spaced at 20 - 30 meters. This same pattern will be observed down the slope and into the gully where the dry tolerant plants will have been replaced by groups of plants that don't like very dry conditions - the shrubs, River Bottlebrush, Callistemon sieberi and Prickly Teatree, Leptospermum continentale and the understorey of Blackwood, Acacia melanoxylon and Sweet Bursaria, Bursaria spinosa. These plants will also be grouped or in rows along the edges of the gully where they can find more moisture. 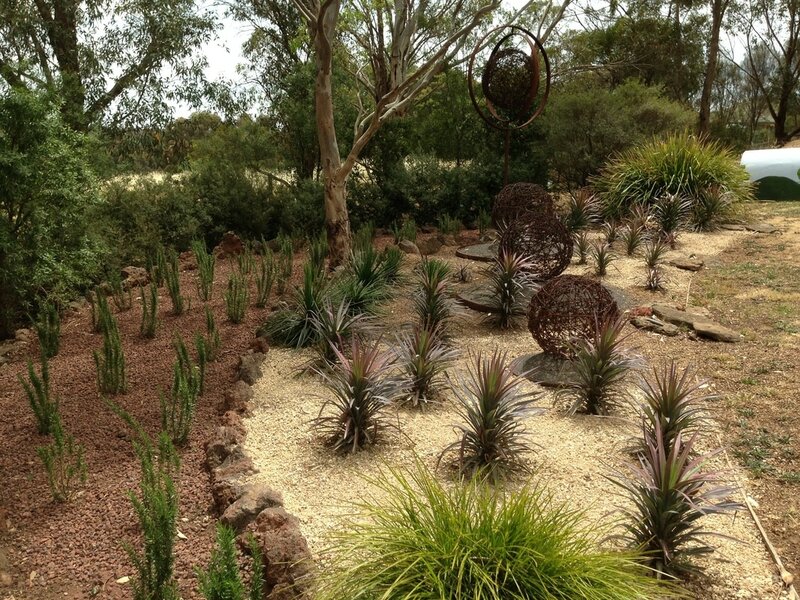 A garden designed and planted by a professional gardener at Teesdale, Victoria. He has used grouping and sculptures to create a stunning landscape. Mimicking this observable pattern of grouping creates a natural environment that is attractive to wildlife and to people. 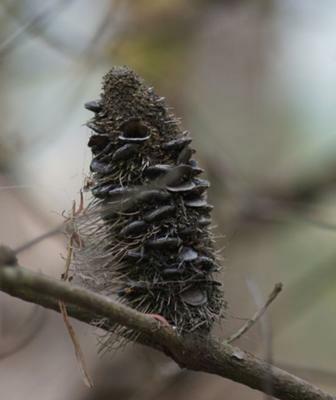 A walk through an established sustainable biorich plantation is like a walk through natural bush and the wildlife it attracts is diverse and vibrant. It is also aesthetically beautiful and this has been recognised and used to advantage by landscape architects for decades. Next time you visit a professionally designed garden you are likely to notice how plants are clumped together with others of their own species creating big splashes of colour and contrasts of foliage. This works well in both gardens and in plantations. On farms a plantation is usually viewed from across a paddock while feeding out grain for stock or harvesting crop. Same species grouping enables a farmer to fully appreciate contrasts in the leaf colour of the different clumps in a plantation and these contrasts are even more stunning when plants in a group are in flower. Grouping has many advantages for plants and the insects and animals that they support. An important advantage for insects and animals is that much more nectar is on offer from groups of plants than a single isolated plant. They find it very attractive when there are many plants of the same species flowering at once. A flock of birds can move from plant to plant on mass and have their fill while they talk to each other and keep a communal eye out for predatory raptors like the Grey Goshawk. Its more efficient and there is safety in numbers. Imagine a human world where you had to shop at lots of shops to gather your daily food needs instead of having the convenience of one store that stocked a full range of foods. The plants benefit from attracting a variety of visitors because insects, birds and mammals all feed and move about in different ways ensuring that the flower pollen is distributed as widely and thoroughly as possible. Birds and insects for instance may carry pollen for several kilometers adding important diversity to the gene pool. Good pollination will result in plenty of viable seed with the excellent genetic diversity provided by many parents. 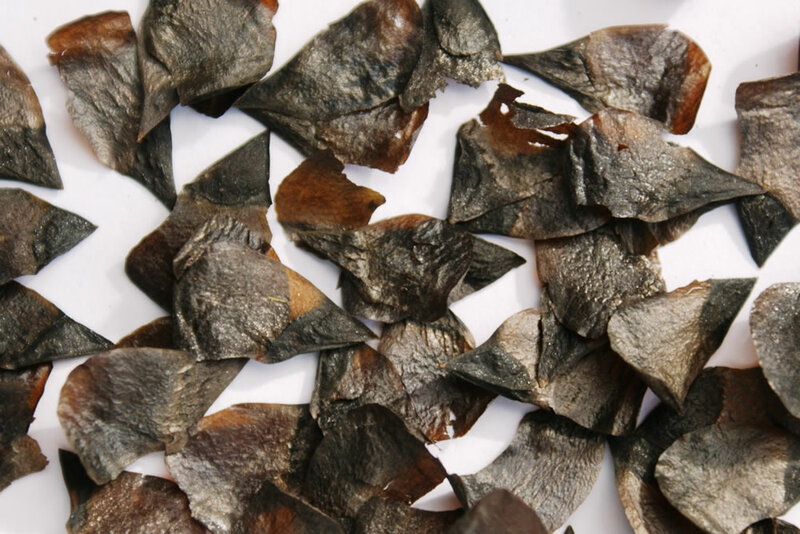 This quality viable seed is critical for the regeneration of each of the plant species included in a plantation. The result will be that the plants will replace themselves in the same way that trees and shrubs in the bush have done for millions of years. Science tells us that in the plant world there needs to be 50 - 200 reproductive individual to ensure enough genetic diversity for a plant communities long term survival. the 22nd century and beyond. These large numbers ensure that there is enough diversity in their genetics to survive catastrophic events and disease. Only a few individuals may carry a protective gene that will enable a plant or a mammal's immunity to cope with a new disease. The devastation of the Tasmanian Devil is a good example of the importance of a large population. Of the thousands of Devils that live in the Tasmanian wilderness, only a few individuals are immune to the Facial Tumor Disease. This diversity will enable the Devils to rebuild their numbers in time. In a small population this may not have occurred. Designing for the long term survival of a plantation therefore has to take into account geneticists observations about species numbers. We now know that if a plantation is to survive for hundreds of years each plant species will need to have at least 50 of its own kind. We also know that each of these plants will have to be close enough to share pollen and the most reliable way to do this is to plant each species in groups. The more we isolate plants the more work it is for pollinators and it is more likely that some plants will be missed or poorly pollinated. The group size increases with the size of the plantation - the bigger the plantation the bigger the group size. A 1 ha plantation (e.g. 50m wide x 200 m long) will need about 1,000 mixed native plants (calculated at an average 3m spacing). If we aim for the ideal species diversity we would include 20 species (from 10 genera and 7 families) and plant 50 of each species (20x50=1,000). It then follows that we could plant 5 groups of 10; 10 groups of 5 or even 2 clumps of 25 plants to have 50 individuals of each plant species. A 10 ha plantation (e.g. 50m wide x 2,000m or 100m x 1,000 m) would allow us to scale up the group size accordingly. We will need 10,000 plants made up of 20 different species and 500 of each species (20x500=10,000). 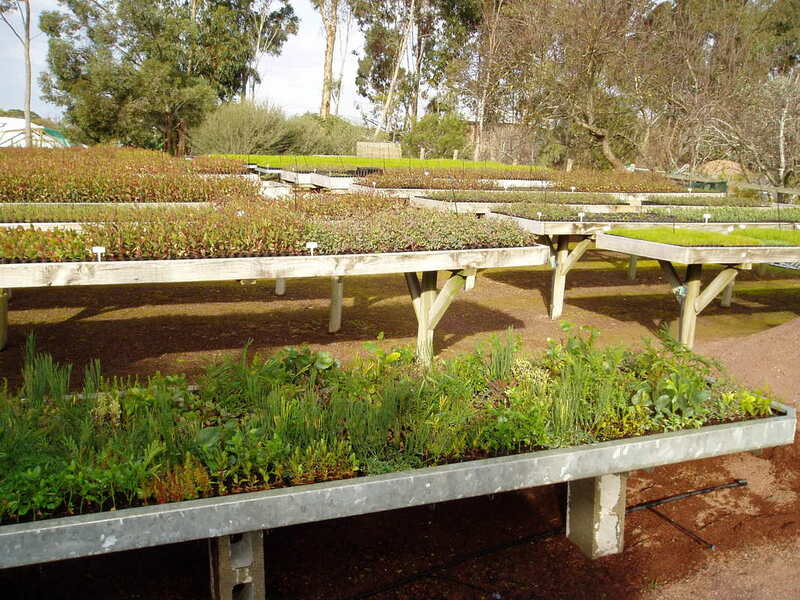 In this example we could plant as many as 10 groups each with 50 plants of the same species and these groups would be regularly spaced through the plantation. The overall plantation area (including linked remnant patches or forestry plantations) effects who will live there. 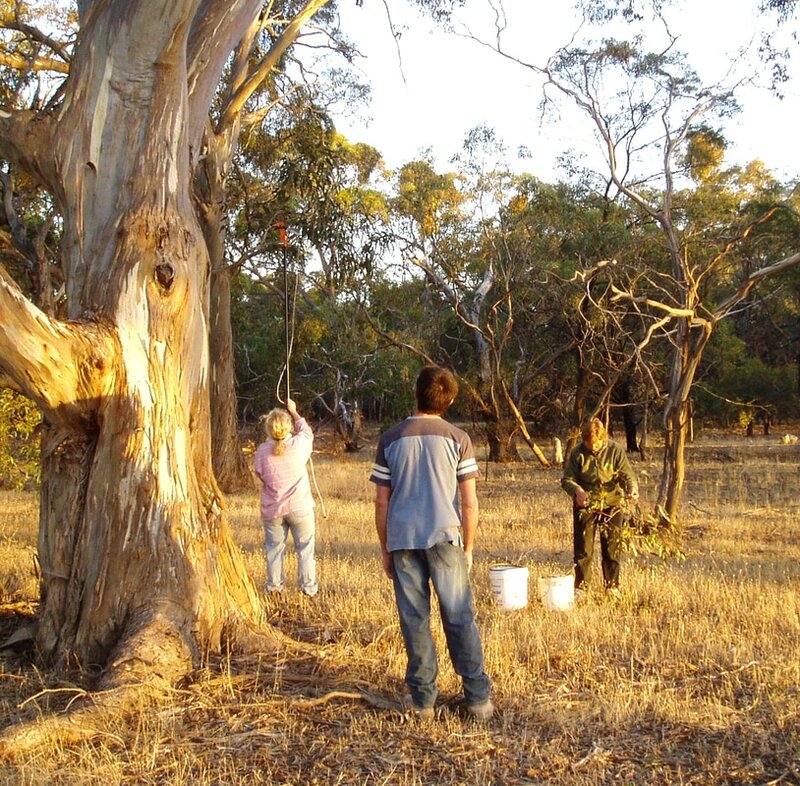 For example ecologists tell us that 10 hectares is a critical size for remnant bush. 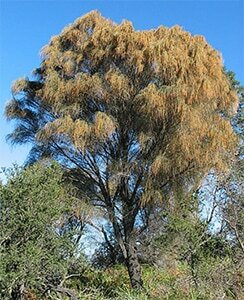 A patch of bush that is smaller than 10 ha is not likely to support the Striated Pardalote or the Eastern Yellow Robin. The Hooded Robin needs a much bigger patch of bush (> 100 ha ) to survive. Providing wide vegetation links between remnant patches of bush will enable these birds to make their homes there and become part of its balanced ecology. Keep in mind that birds naturally forage for food in a 'bulls-eye' pattern, spiraling out from a central point. They will therefore do better foraging in a footy oval shaped bush than a cricket pitch shaped bush. Therefore linking to wider more square shaped patches of bush is good design. 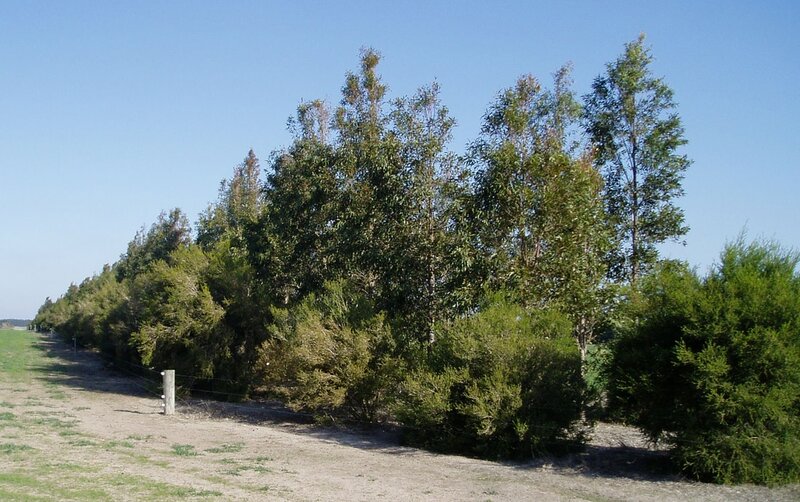 A 12m wide plantation with an outer edge of Moonah, Melaleuca lanceolata. Narrow plantations of less than 25 m.
It is practical to incorporate smaller group numbers of 5 - 10 into narrower plantations to enable taller species to be included in the adjacent rows for optimum stock shelter. A pyramid shape with shrubs on the outer rows, understorey in the next rows and canopy trees in the centre rows allows light into all areas of a plantation and mimimises the negative effects of competition for soil moisture. Putting the smaller plants along the outer edge, well away from the thirsty tall trees in the centre has another definite advantages. It reduces the 'edge effect', a measure of how far extreme weather penetrates into a plantation. Open plantations let all the cold winds blow through making them much less attractive to wildlife. Try opening all the doors and windows in your family home on cold windy day to experience the 'edge effect'. 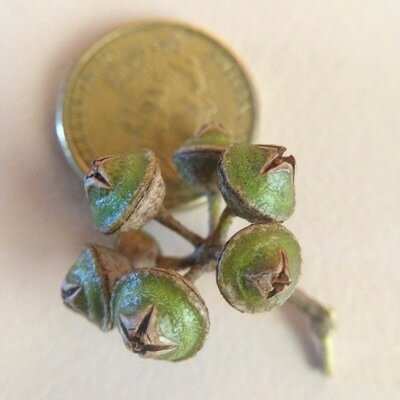 The mature size of each plant. Shrubs that are only 2 m tall won't stand out in the crowd if their neighbour is a lanky 20 m tall tree. Therefore the lanky 20m tall trees can be planted in smaller groups because they will be easy to spot by pollinators and as they mature they will offer much more food and quite a bit of variety. One mature flowering eucalypt will feed hundreds of Musk and Purple-crowned Lorikeets, however it may take 50 bottlebrush shrubs to produce the same nectar flow for these hungry Lorikeets. An important exception is canopy trees planted for Forestry. For the practicalities of pruning and harvesting plants grown for profit, it is important to make it easy and convenient get access. In this situation larger groups of 50 or more are appropriate because maintenance work and harvest is focused in these areas. ﻿These plants are then easier to locate, vehicles can be driven for convenient collection and disturbance to the areas planted for biodiversity is minimised. At the 'biorich plantation' at Lal Lal ﻿9 species of eucalypt and 1 of River Sheoak, Casuarina cunninghamiana were planted in groups of 50 beside the access track. Click on the above link to read about the design. 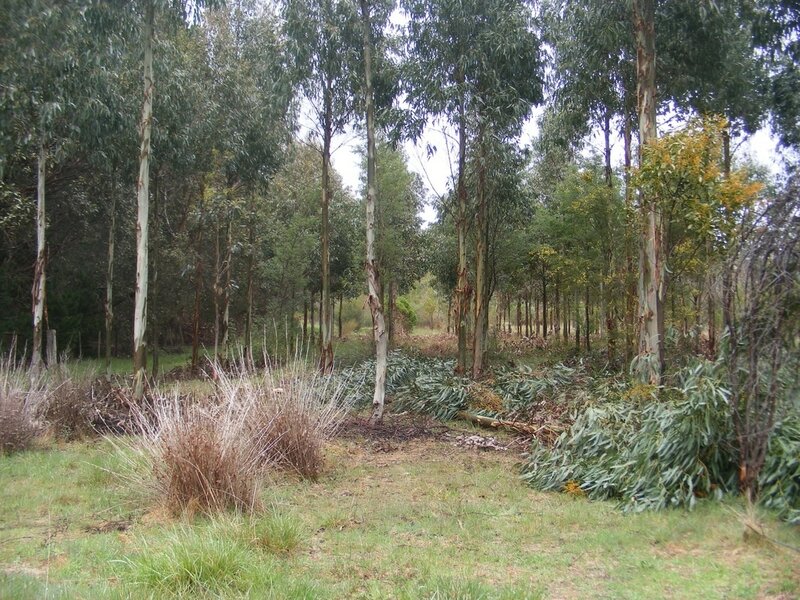 Shrubs (2-5m) and understorey trees (5-12m) are planted in large groups of 50 or more in a large site of 2 - 10 hectares. This not only looks natural but it also provides a ready source of food for flocks of foraging birds. 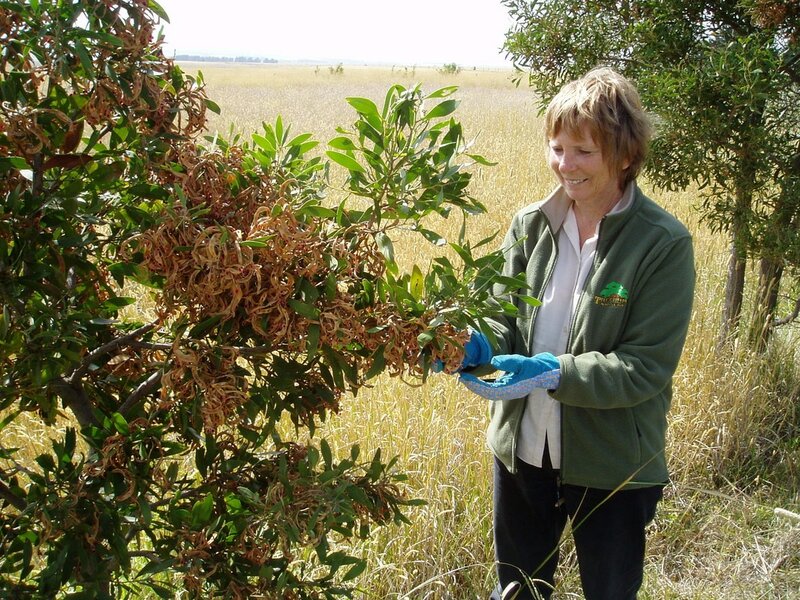 If planting for profit is an attractive option, some of these groups can provide a source of income from cut flowers, nuts, aromatic oils, seeds, bush food or timber. 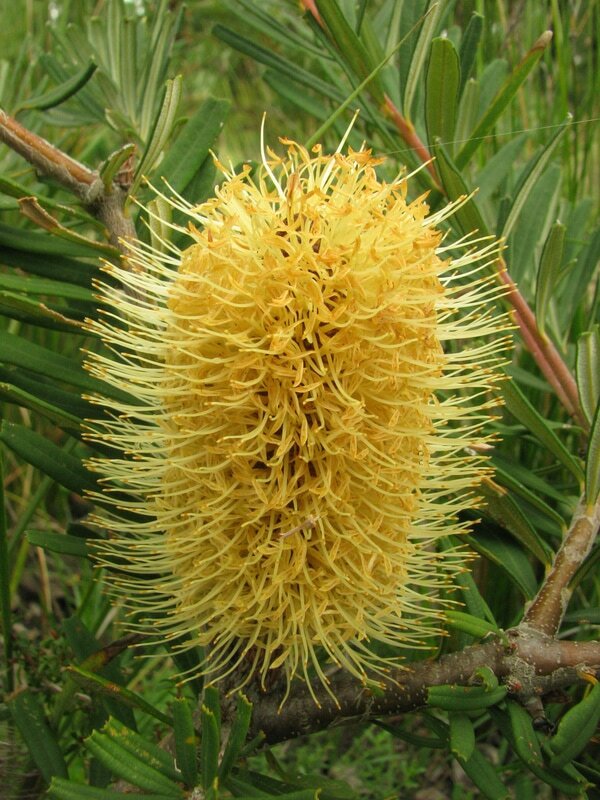 For example groups of selected flowering banksias could be planted for the cut flower market. They would also become part of the shrub layer and provide habitat and nectar for wildlife. Groups of shrubs planted for harvest would also be located where access is more convenient, usually on the outer edge. See biodiversity and profit for more ideas. Good breeding is something that every farmer is conscious of when buying new stock or fresh grain for cropping. Good breeding is a foundation principle that every primary industry builds its hopes on because if we fail to get it right at this fundamental level, the success of the whole enterprise is put at risk. A plantation of indigenous trees, if it is to be sustainable, has to be built on these same principles. However, the foundation for a sustainable plantation is a diverse gene pool which provides the genetic viability that will enable the plantation to adapt to change in the long term. A Sustainable biorich landscape is one of the few human endeavours that is intended to endure for over 200 years, so having good foundations is a fundamental requirement. What would we have said to Christopher Wren in 1675 if he told us he was cutting back on the foundations of St. Pauls Cathedral to save on escalating costs? We're all grateful that Wren did build this wonderful London landmark on good foundations because it has stood the test of time. 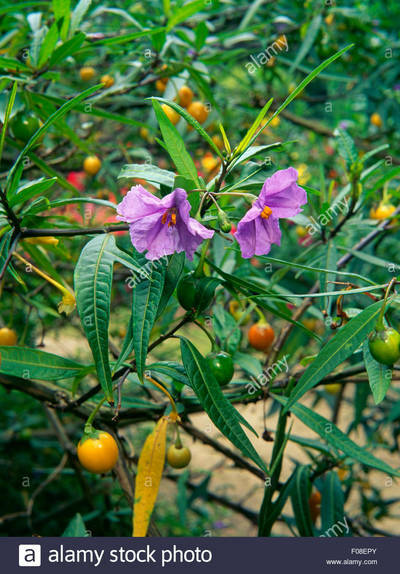 Unlike stock and grain, which have evolved through breeding and selection resulting in a narrower gene pool than the primitive animals and grasses that they were bred from, the native plants local to an area (indigenous) are still in their primitive and natural form. This would usually mean that they are genetically diverse, but unfortunately their gene pool has been narrowed by vegetation clearing and isolation. The vegetation corridors, that in the past enabled plants to adapt to change by bringing in a range of pollinators carrying new genes, have been removed. Most of Australia's natural heritage is now in isolated patches of crown land and private property, the latter being home to over 70% of our surviving remnant vegetation. Building good genetic viability is as simple as picking fruit from a tree. 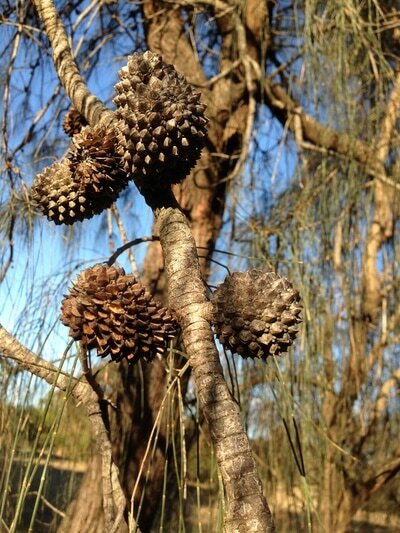 The ripened fruit on Australian native plants looks like a gum nut, a sheoak cone, a wattle pod and Kangaroo Apple fruit to name a few. This fruit is dried and cleaned to remove the seed and then stored at a low temperature to keep it fresh and viable for future years. The wing on the Silver Bansksia seed will carry it well away from the 'mother' tree where it will germinate after soaking rains. There is one very important extra step but its also very enjoyable. This is where the seed collector gets some exercise and explores the bush as they walk around from plant to plant collecting small amounts of 'fruit'. Geneticists recommend that seed is collected from a minimum of 20 parent plants. Sometimes the plant community is too small to collect from 20 plants, so just do the best you can. In the adjacent diagram you will see that seed collected from 'closely related' trees is likely to be inbred and seed collected from 'outliers' may be self-pollinated. The majority of seed would be collected from the scattered trees in the body of the patch of plants which has greater genetic diversity. Some of the 'inbred' and 'outlier' seed can be included. 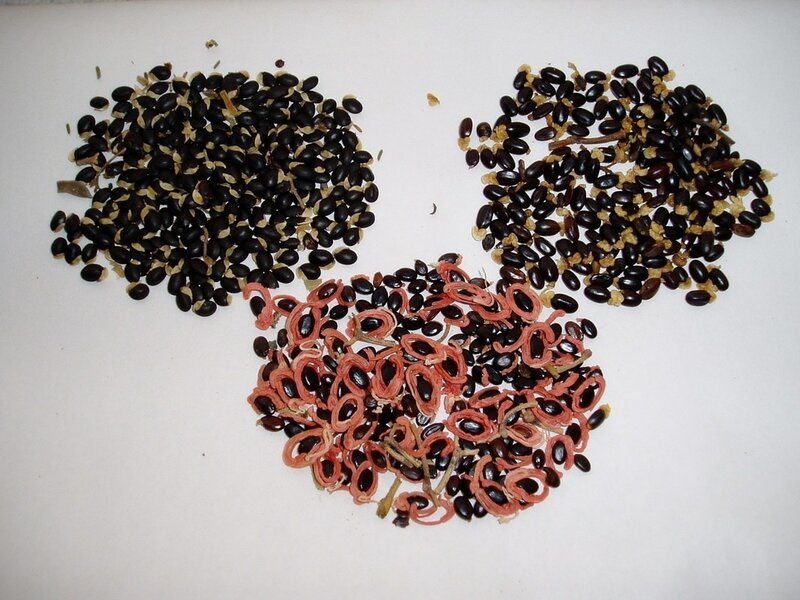 Mixing seed from different collection years from the same site diversifies the gene pool because each year pollinator movements are different as is the weather. Pollinators may therefore be active earlier or later and may also fly in from different directions and from different plants. As mentioned earlier, many of our remnant patches are isolated, so the pollen that carries the plants genes is likely to be coming from close family members creating a narrow gene pool. This can be overcome with a bit of seed mixing. 'Composite provenancing' or mixing seed. 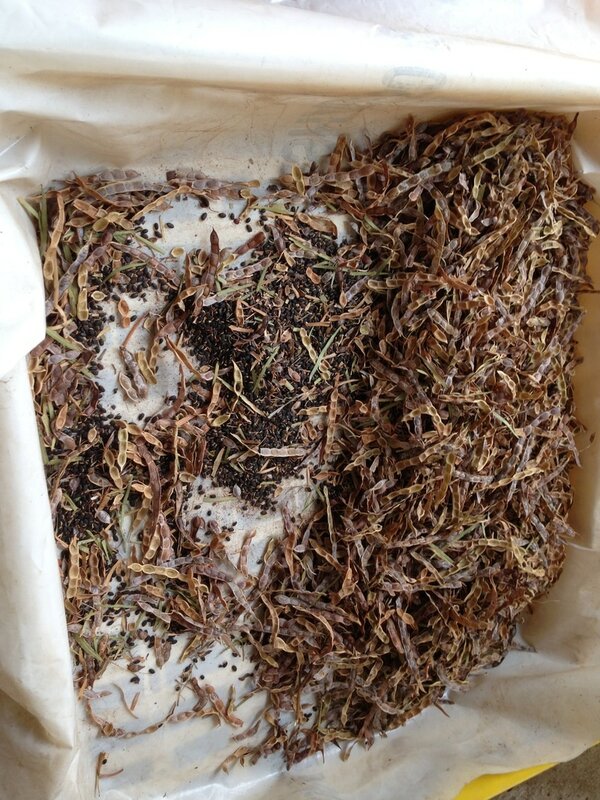 Pollen distribution by insects and birds would commonly have been over 10 - 20 kilometers or more, so mixing of seed from healthy patches over these distance is arguably a necessary and reasonable adaption of seed collection practice to our changing times. Geneticists also advise that because plants in a future Australia will have to adapt to long dry periods and lower rainfall, 10 - 30% of seed from dryer locations can be added to this seed cocktail. This practice may enable our indigenous plants to survive into the 22nd and 23rd centuries. 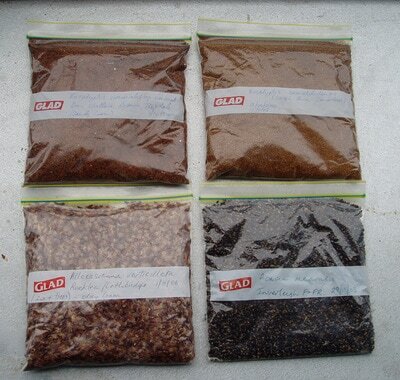 The science of seed collection will hopefully be taken care of by your plant supplier though I think it is useful to understand the fundamentals of good seed collecting practice. If you are planning to design and plant a sustainable biorich plantation then a lot of the effort that's put into design, site preparation, planting and maintenance may be in vein if this fundamental foundation work falls short of what is necessary to provide enough genetic diversity and long term resilience to enable a new plantation to survive into the distant future.